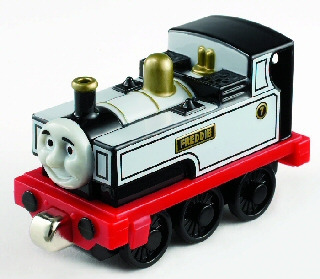 After many years of absence Freddie returned to the Skarloey Railway. Although the reason for his absence is not stated, one can presume that Freddie was either on loan to another railway or undergoing an extensive overhaul. Upon returning home, Freddie challenged Rheneas and Skarloey to a series of races up and down the mountain. After realizing that he wasn't as strong as he once was, Freddie used his knowledge of the mountain routes and short-cuts to secure victories. However, when his cheating placed Rheneas in danger, Freddie was forced to put his knowledge to better use.